Dracaena marginata is a very durable, easy to care for plant that will slowly grow to a multi stemmed, 10 feet tall shrub. or can be forced to branch by cutting the stem tip. The Madagascar Dragon Tree has narrow, dark green, arching leaves that are edged in deep red. 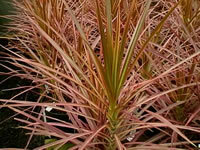 Many hybrids have been introduced that have other colors of foliage, as well. Dragon Trees make an excellent, drought resistant, accent plant for growing in partial to light shade. 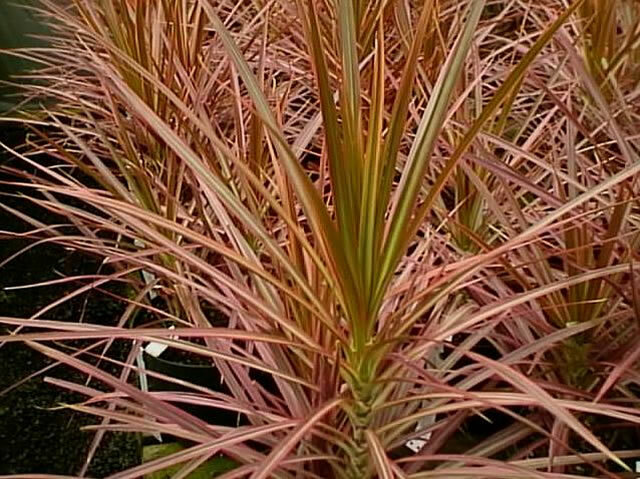 Dragon Trees will adapt to a wide variety of light conditions, but will have the best foliage color when they are grown in bright, indirect light. Green varieties can survive with considerably less light. They should be potted in a well draining house plant soil. Dracaena marginata plants are very drought resistant, but they should be watered on a regular basis, nonetheless. Wait until the soil surface is dry to the touch, then water them thoroughly, using water that has been allowed to set for 24 hours. Never allow the soil to remain constantly wet! Dragon Trees appreciate an occasional misting of their foliage. Fertilize them monthly with a balanced house plant fertilizer. your Dracaena should be moved to a cooler room. as they are the most common insect pests that attack Dracaena plants. or with tip or stem cuttings taken in late spring or summer.